Are you a bar or restaurant owner in a region that can experience some chilly temperatures? Members of the hospitality industry are beginning to increase their profits by expanding the hours that terraces, patios, and other outdoor spaces are in use. 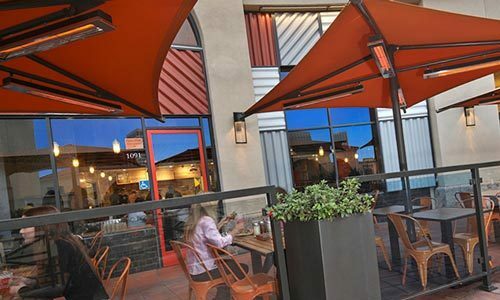 Outdoor commercial heaters can keep your patrons comfortable on chilly days and well into the evenings. There a wide range of outdoor heaters that are suitable for fixed installation if your location is short on space, or are portable to provide more flexibility. For owners looking to make a purchase, brands Patio Comfort, Sunglo, and Sunpak are well-reviewed as effective heating options. Whichever model you choose, you can rest assured that you will see an uptick in your sales! As evening falls and temperatures dip, do you notice that your guests are quick to leave their outside spots? With an outdoor commercial heater, your guests will likely linger a bit longer and order another round of drinks. It is likely that your patio heater will soon pay for itself with increased guest checks! Think about how packed your patio is on beautiful and sunny days, now think about your bar or restaurant with that many patrons on any type of day! Infrared heaters can be affixed to the ceiling of your outdoor area to provide ambient heat and keep your guests comfortable. The finishes that are available include white, off-white and black that can be matched to suit your decor and be less noticeable. There are also front covers that are very effective at making the heater disappear into your ceiling. These heaters can run on natural gas or electricity, and typically produce enough heat to warm a 12' x 12' area. The heaters are also equipped with timers and high/low settings that prevent the area from becoming too warm. The ceramic heating element works to heat the objects on your patio, rather than just the air which makes it more effective in keeping an area warm over a longer period of time. Portable propane heaters are fully movable and provide heat to the areas where you need it most. 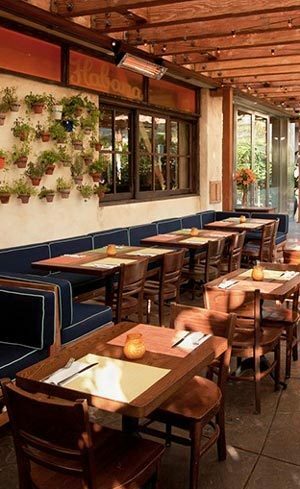 Many restaurants have one or two for the space that they can move near their diners as necessary. Propane heaters are preferred by many owners due to the ease of moving them around as needed. They also can heat outdoor locations that are impractical for other heaters. A propane heater can typically work for about ten straight hours on a full tank (20 lbs) of fuel. There are many new styles being added to the market in addition to the utilitarian stainless steel model that remains a popular choice. If you are seeking an easy way to boost your outdoor sales, the propane heater is an effective tool to attract and keep more customers in all kinds of weather! The hospitality industry often has tight margins, and any way of increasing food and beverage sales is always welcome. If your outdoor space is sitting empty more often than you like, it's time to take a look at your outdoor heating options. There are heaters available for almost every budget, with different options to suit your establishment depending on the size and use of your patio, deck, or sidewalk terrace. Everyone loves to enjoy a meal or cocktail outside on a beautiful day, and now you can provide that sunny day ambiance in cooler temps and into the evening. Keep your customers feeling cozy and welcome and enjoy a higher level of sales during the mild spring and fall months. Finding an easier and more effective way to increase the frequency and length of your patrons' visits than making them more comfortable as they enjoy an evening outdoors. You may be surprised at just how much of an impact outdoor commercial heaters can have on your bottom line!